Looking for work in New Zealand? We can help! Any person coming to New Zealand for work will most likely require a work visa. It is also likely the granting of your visa will be based on getting a job offer. We can help with that. How can I get a job without a visa when I need a visa to get a job? Do I need to be on a skills shortage list? Are my skills in demand? What is the best way to look for a job in New Zealand? New Zealand employers are constantly looking for overseas workforce to bridge the local skills shortage. Your talents may be in high demand. Let us help you with the right approach to find a job in New Zealand. Our team comes from different backgrounds and their vast expertise will prove invaluable in your job search. By working along your side during the entire process, we will provide support in many ways. 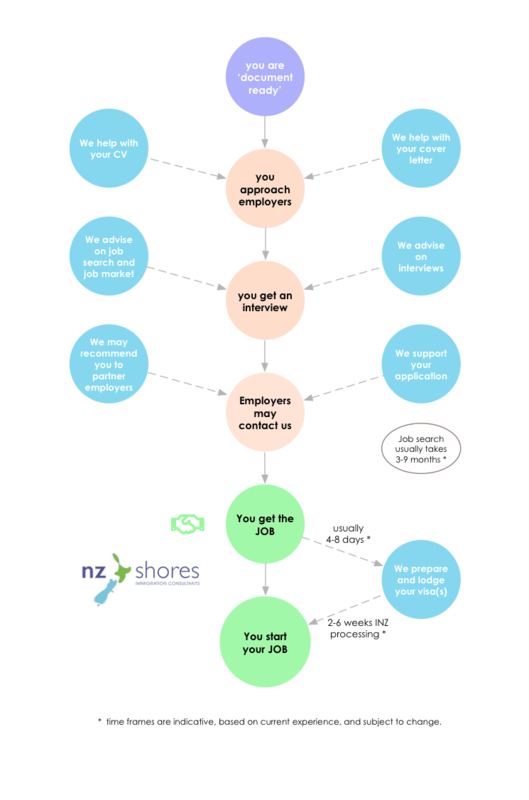 How can we help with your New Zealand job search? a template cover letter to help you apply for the jobs you think best match your skills and expectations, and maximise your chances of getting an interview. Your personal Adviser will guide you through the documentation, job-search, and visa processes, step by step. Based on your personal situation, you will be provided with detailed instructions on the various documents required to lodge a visa application. Once these have been obtained, you may start looking for jobs. Why becoming document-ready before even being offered a job? Some documents may take weeks, months even, to obtain. Think police certificates, or work references. Your New Zealand employer may not be willing to wait that long before you can start work. By having most documents ready when you are offered a job, you should be eligible to work within 4 weeks, and you can therefore ensure that your job offer will not be withdrawn.